Do you remember what was the most often used way that Jesus taught the multitude – parables. The people could remember Jesus’ words every time they saw the everyday things that Jesus spoke about. (I can well remember one parable from years ago, about fruit picking). I can almost hear you say – but what have parables got to do with Advent Books? Well God can speak to us any time any place and so this is about the times when God speaks to me whilst using the Folding Machine. Whilst running the machine and folding the flyers each morning I have been aware of the many lessons God was teaching me whilst I folded. I was amazed at the number of times God brought out parables teaching me this or that lesson and then I began to realise that I should write them down and so Lessons from the Folding Machine began to materialise. But before the flyers can go through the folding machine they have to be printed and then they are put onto the jogger to jog them into a straight neat pile of 100 leaflets. If they don’t go onto the jogging machine, they don’t go through the folding machine properly. Here was my first lesson – sometimes God allows little trials to come into our lives – but this is for our own good – it will help us to face and survive the bigger trials, which are coming later. “Through trials and persecution, the glory (character) of God is revealed in His chosen ones. The church of God, hated and persecuted by the world, are educated and disciplined in the school of Christ. They walk in narrow paths on earth; they are purified in the furnace of affliction. They follow Christ through sore conflicts they endure self-denial and experience bitter disappointments; but their painful experience teaches them the guilt and woe of sin, and they look upon it with abhorrence. Being partakers of Christ’s sufferings, they are destined to be partakers of His glory”. Each neat stack of 100 leaflets is put face downwards onto the metal slot. When the machine is switched on, the folding starts and within approximately17 seconds one hundred flyers come out the other end of the machine, precisely folded and ready to be collected together, neatened into a straight stack and with an elastic band around, placed carefully into a cardboard box. Each stack has to be placed neatly into the box, or 21 bundles won’t fit inside. When the box has 21 bundles of leaflets inside, the lid should go on tightly and be ready to be taped down. If the leaflets have not been placed carefully inside, then the lid of the box won’t fit on properly and the boxes will be of different sizes; the different size boxes will not sit squarely on the pallet and the pallets will be difficult to stack with 50 or more boxes. Here was my second lesson. How will we ‘fit’ together in heaven if we haven’t been ‘neatened’ here on this earth. This earth is our folding machine experience. But there were other lessons that God taught me. It is a very noisy machine to operate with a constant clack clack, clack, noise so much so, that I can’t hear the telephone even if it is in the same room BUT, I can hear the very soft singing sound as the bundle of 100 flyers come out the other end and its time to put another bundle onto the machine. If I don’t stop what I am doing and turn round immediately and put my hand gently onto the stack of what is left of the 100 flyers as it goes through the machine, then the last 4 leaflets sometimes have a tendency to get blown straight up so that they are standing upright and then it is impossible to get them to go through the machine to be folded. But you say, how can you hear such a soft sound when the machine is a very noisy one. You see my ears are tuned into hear that sound for I know I need to move extra quickly and help the last few flyers through the machine. You can see the lesson here can’t you. If we are not tuned into and listening for the Holy Spirit’s soft little voice then our ear won’t hear a word behind us when we turn to the right or to the left, saying this is the way walk ye in it. Then there was another lesson as well. I had to put a restraining, guiding hand on the last of the flyers, to help them to go through the machine – God is always ready to help us but he never forces and always waits for us to ask. Sometimes though there were problems, such as the time when the leaflets didn’t go through the machine. What was the problem, why didn’t they go through? Then I noticed that the first leaflet to go through the machine had a very very tiny fold on the exact piece of the paper, which would have met the suction feed first. 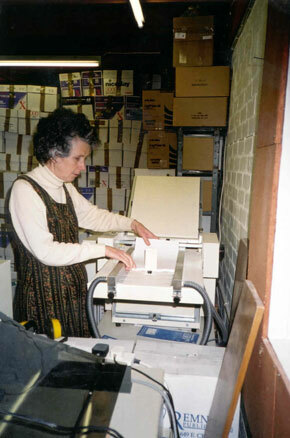 This meant that the whole of the stack – one hundred leaflets couldn’t go through the machine. The machine had to be switched off and the fold carefully flattened out. Just as soon as that was done the flyers went through speedily and in a matter of seconds there was another stack of neatly folded leaflets. That one little fold on one leaflet meant 100 flyers couldn’t go through the machine. Are we by one tiny sin in our lives causing us, and others, to stumble and fall? Something else, which can very occasionally happen and has an affect on other leaflets, is when one of the leaflets is not folded properly. You see in a ‘Z’ fold there are two folds, but if a leaflet has for some reason only got one fold then it is not going to sit neatly with the others, which have two folds. This rather reminded me of the story in the Bible where the guests at the wedding all had on the wedding garment but one man didn’t – he stood out like a sore thumb just like a leaflet with one fold in a bundle of leaflets with two folds. There is no time to sort it out when this happens. I just have to put them to one side until the end. The machine is so fast there is only time to collect each bundle and neaten them, put on the elastic band and stack them into the cardboard box. But why does one sheet of paper not fold properly when thousands of others fold just right. It may be because the sheet is a bit damp or the grain is not quite the same as the others. But do we grumble when things do not go well for us? Did Jesus or the disciples complain when they were being persecuted? We know they didn’t. Jesus didn’t “open His mouth” when He was being persecuted and the disciples sang praises to God when they were in the prison. Romans 8 verse 28 says “And we know that all things work together for good to them that love God, to them who are the called according to His purpose”. So if we are going through a bad time let us keep our eyes on Jesus and the rich reward, which will be ours if we are faithful and endure to the end. The very worst problem was when none of the bundles of 100 flyers would go through the machine without my having to gently nudge them from the back, but they didn’t come through neatly – in fact they came through ripped, torn and generally in a big mess. What was wrong, did the machine need a service, how did an efficiently working machine suddenly produce such bad results? I telephoned the supplier and by a process of elimination we arrived at the cause. You see when a stack of flyers is gently dropped into the slot ready for the suction feed to take them through the machine, I but them up to the metal plate at the back which means they are all neatly stacked ready to go through and all be folded at exactly the same place. After thousands and thousand have gone through, (each bundle of flyers butting up to the metal plate every time) then the metal plate had moved – ever so slightly but it had moved. It had only moved an nth of an inch but nevertheless it had moved and I had to undo the screw, which held it in place, put the metal plate back and retighten the screw. The result, the flyers now went through the folding machine as they had done before – neatly folded into a ‘Z fold. Of course I realised the lesson here. One little sin will keep us out of the Kingdom and the fellowship we will have with Jesus. We may not even know we have sin in our lives but we can know this if we get in touch with our Supplier – Jesus. The Holy Spirit will tell us and will give us the information to enable us to realise our fault(s) and the power to put them right. But we need to be constantly on the alert, keep looking at the metal plate and testing the screw – has the plate moved, does the screw need tightening? Once after folding all the printed flyers, we still needed a few to complete the planned mailshot booking. I hadn’t done it before but I decided to print some flyers and immediately put them through the folding machine. Usually the flyers are printed one day and folded the next. This is the correct way to do it. The printed sheets needed to be thoroughly dry. But the folding machine didn’t like these slightly damp sheets. It struggled and I only put through one bundle of one hundred sheets. Does God give us trials before we are ready? 1 Corinthians 10 verse 13 says “There hath no temptation taken you but such as is common to man but God is faithful who will not suffer you to be tempted above that ye are able; but will with the temptation also make a way to escape that ye may be able to bear it”. After many lessons from the Folding Machine I thought there can’t be any more things to learn but I was wrong. You see each time one hundred flyers are printed they are stacked in a box awaiting the folding machine ready to be folded into a ‘Z’ fold and with an elastic band around placed inside a box ready to be stacked on the pallet with the other boxes. The stacks of one hundred flyers are separated by a little strip of paper so that each bundle of flyers can be picked up easily. The little strips of paper are usually made from the wrapping paper in which the reams are packed. So the strips of paper are blank on one side but have the paper company advertisements printed on the other side. As each stack of flyers is picked up, the strips are hastily put into a box lid with all the other strips. They are not neatly put in the lid – there is no time with 17 seconds to do all the operations ready for the next bundle to go through the folding machine. With many thousands of bundles in a morning’s folding, there are many – hundreds in fact – of the strips in the box lid ready for the next printing session and usually the strips are tossed into the box lid all tumbling one on top of another. Well this lesson is about what happened one morning. One day when folding early in the morning as I usually do, I let my mind wander and found myself thinking of something that had happened years ago, something that had hurt me very much. I dwelt on that hurt and soon found that anger had crept in. Whilst tossing one of the paper strips in the box lid, something caught my eye. This strip had something typed on it. Not only was there something typed on the strip of paper but in all that confusion, this strip was the right way up without any other strip of paper blocking any of the wording. I was able to read the first few words and then had to get on with the folding. But the next time I picked up a bundle of leaflets, I carefully removed that strip of paper with typing on and when I had finished the morning’s folding, I read it and felt very very humbled; I thanked God for His intervention, for the miracle of that one piece of paper being in the right place, the right way up, and for rebuke contained in the words. And what were the words? From where did this strip of paper come - it was not printed by Advent Books. I also needed to find from whence came the quotation. It had made a deep impression on my mind and I asked God that I would not indulge this sinful trait of character, that I would forgive as He would forgive me and that I would let God erase it from my mind. Later, on the CD ROM, the quotation was found – GC page 558/9 but we still don’t know where the strip of paper came from! Does God speak to you while you are dong some mundane task? Are you listening?